Republic Lockers - RS Locker Repair & Installation, Inc. They feature heavy 16 or 18 gauge steel doors mounted in welded frame assemblies for strength and durability. Reliable recessed handle and proven latching system ensure maximum security, while louvers provide ventilation. 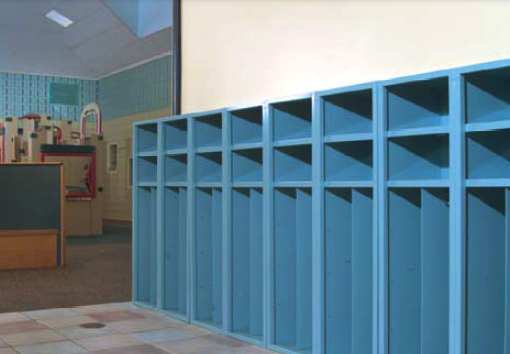 Lockers are conveniently available in pre-packaged, 1 – wide and 3 – wide groupings. 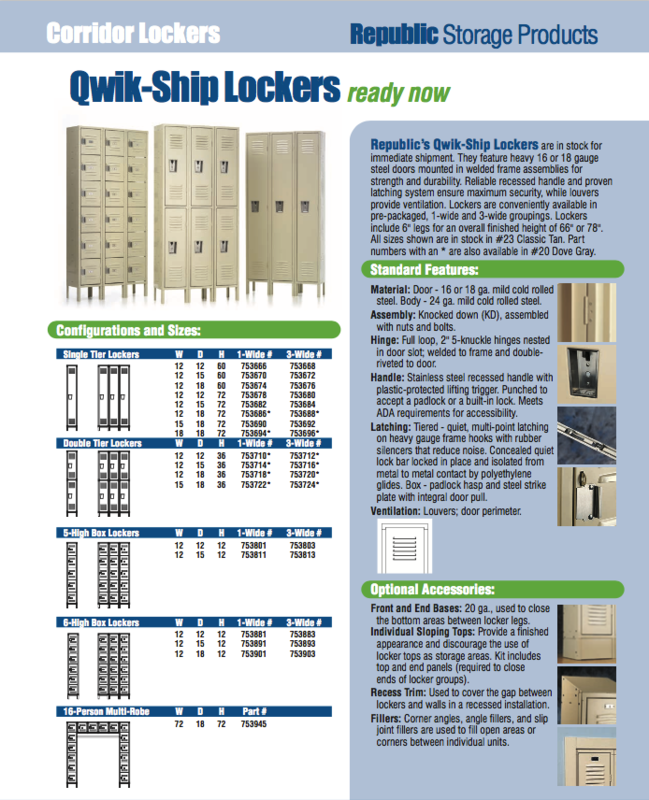 Qwik-Ship Lockers include 6″ legs for an overall finished height of 66″ or 78″. 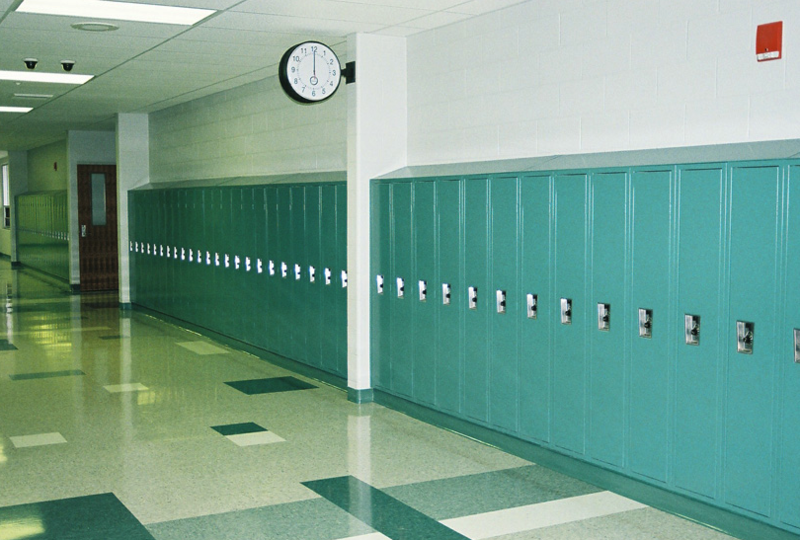 Republic’s Standard Locker offers economical storage of personal effects in schools, parks and recreation areas, offices and industrial locker rooms. Continuous vertical door strikes, heavy gauge frame hooks and full-flanged, channel edged doors lend quality and security to the locker. Recognized by its recessed handle and distinctive door louvers, the Standard Locker serves as the industry benchmark for durability, reliability and value. Republic’s Quiet Locker, the most popular choice for schools, meets the basic needs of the school environment: noise-free operation and recessed handles for flat door surfaces. It features continuous vertical door strikes and full-flanged channel edged doors for added strength and security. Double lapped rear vertical corners stiffen locker bodies. Full loop, nested hinges are welded to frames and double-riveted to doors to eliminate hinge failure. 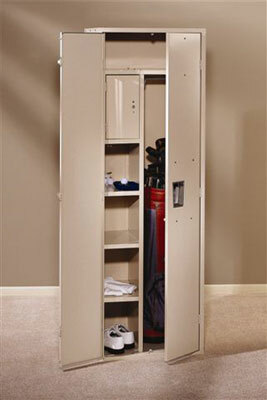 The combination of solid construction and competitive price makes the Quiet Locker the best value on the market today. Republic’s Single Point II Locker gives you the benefits of single point latching at an economical price. A heavy 14 gauge door is reinforced on the hinge side for added strength and rigidity. When padlocks are used, the Single Point II is virtually maintenance free. Full-loop, nested hinges are welded to frames and double-riveted to doors to eliminate hinge failure. Single Point II Box lockers offer small storage areas with a flush front door design. 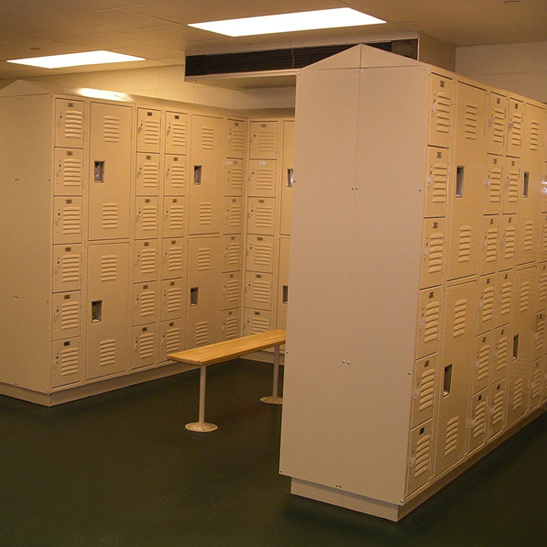 For low maintenance and high security at an affordable price, Single Point II Lockers are the best choice. 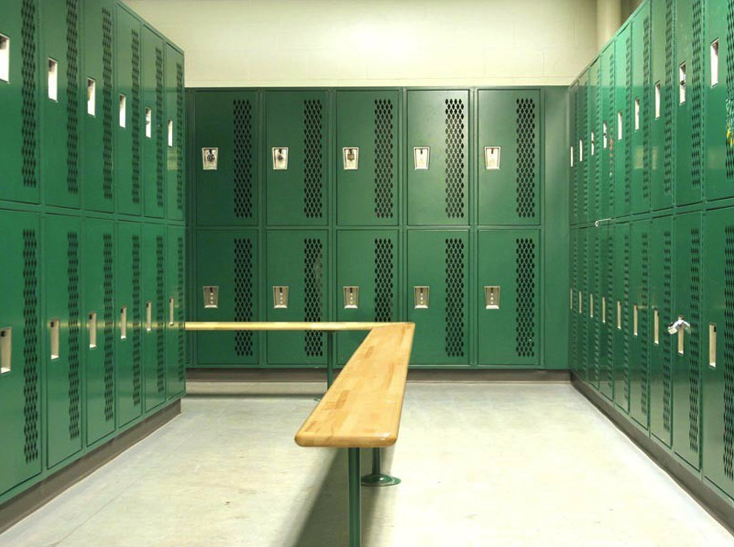 Republic’s Heavy Duty Ventilated Lockers are designed to meet the harsh requirements of an athletic room environment. 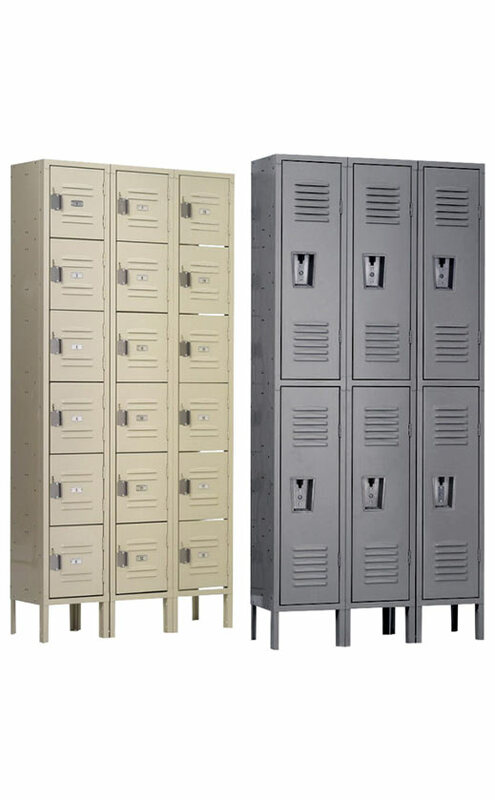 Built to last, these lockers feature knocked down construction, rugged 14 gauge doors, a heavy gauge body, multiple latching options and our premium paint finish throughout. 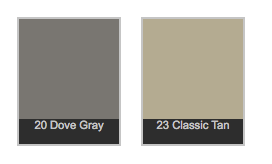 Republic’s All Welded Ventilated Lockers incorporate the superior design features of the Heavy Duty Ventilated Locker. These lockers feature welded construction, rugged 14 gauge doors, a heavy gauge body, multiple latching options and our premium paint finish throughout. 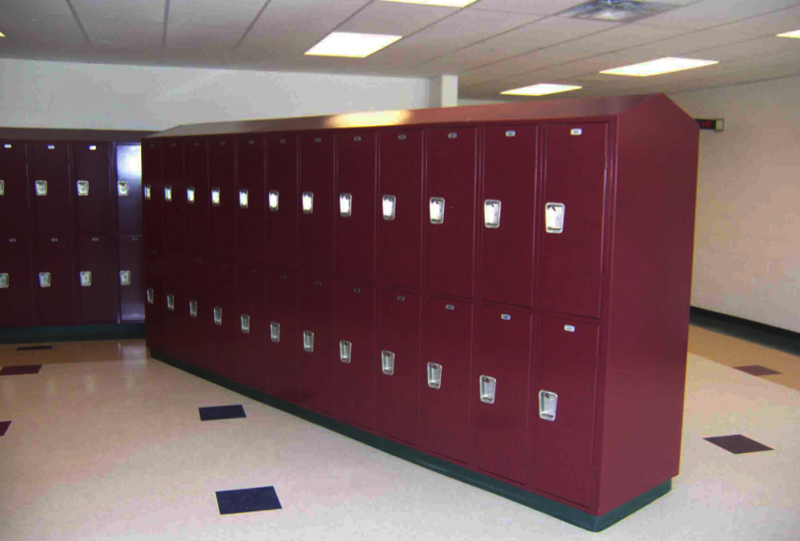 All Welded Ventilated Lockers utilize a unique, one piece back/side design for added strength and improved group alignment. Welded Lockers are shipped preassembled and ready to install. Republic’s Single Point II Locker brings the benefits of latching with no moving parts to atheltic environments. Heavy 14 gauge doors with reinforcing on the hinge side stand up to the tough standards of an athletic team room. Box locker doors with optional reinforcing are also available. 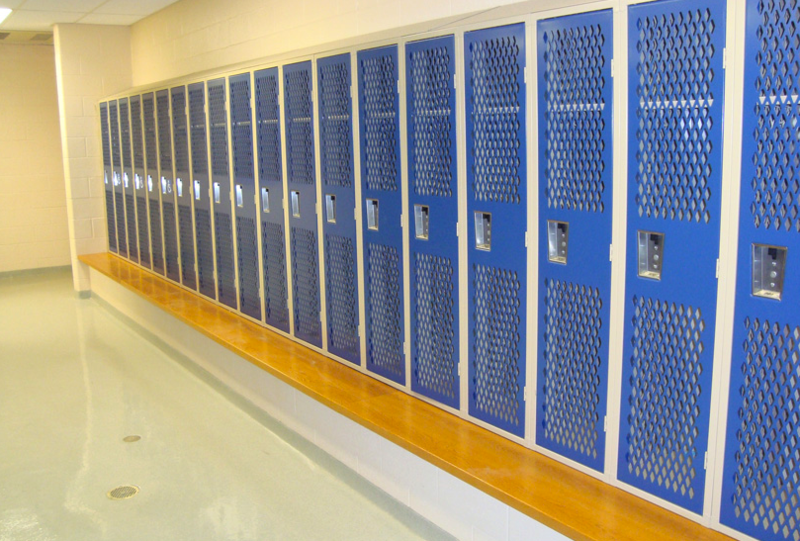 Continuous vertical door strikes, heavy gauge bodies, nested hinges and our premium paint finish throughout add to the long life of the locker. 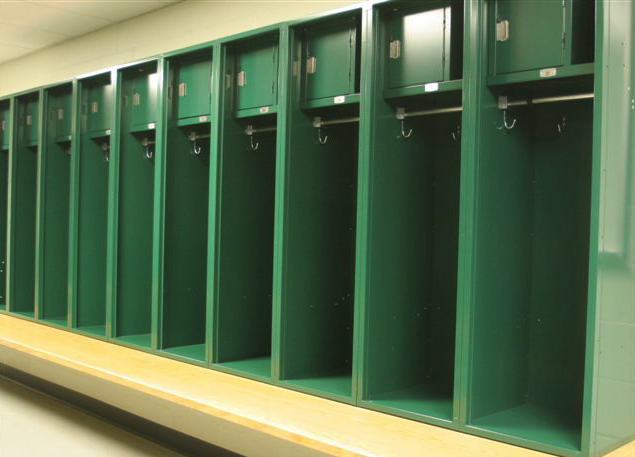 For low maintenance and high security for the athletic locker room, Single Point II Athletic Lockers are the best choice. Republic’s MVP Athletic Locker is a requirement for any athletic team. 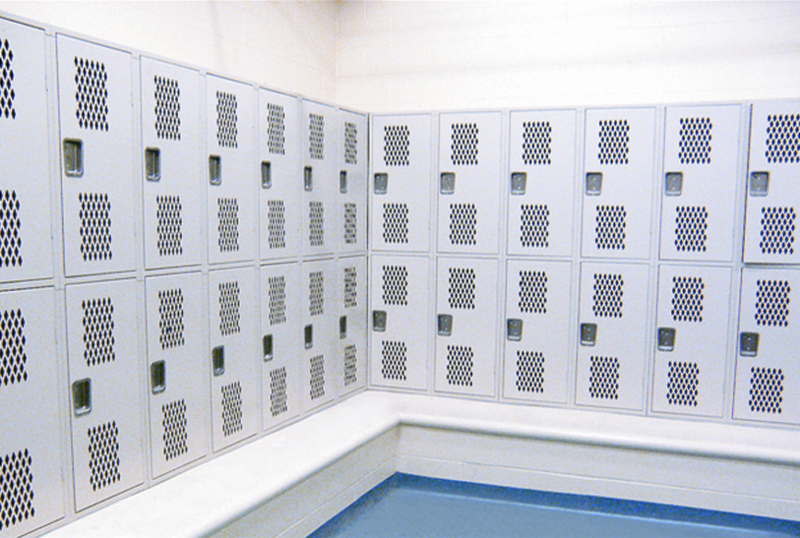 With an open-front design, the over-size MVP Locker provides a large, closet-type space for clothing and uniforms and an optional foot locker for equipment storage. An upper shelf is ideal for small items, while the optional lockable compartment adds secure storage for valuables. Heavy gauge steel body parts and our premium paint finish guarantee durability in the demanding environment of a team room. Many Republic Corridor and Athletic Lockers may be customized to conform to ADA locker requirements for accessibility and usability. 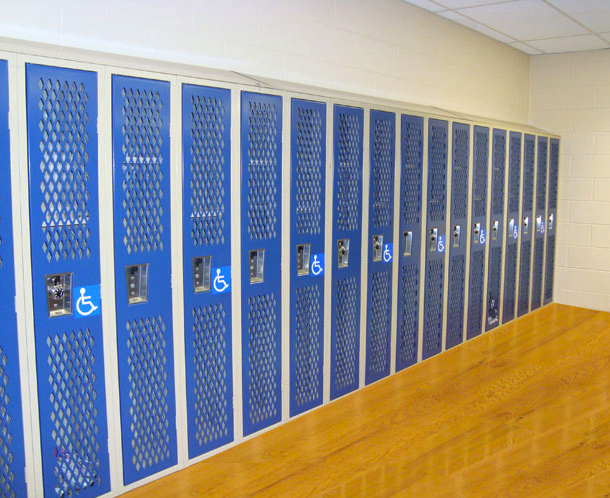 Although the Americans with Disabilities Act (ADA) does not address lockers specifically, it does refer to features that are found on or in lockers and provides guidance for the placement of lockers within a room. With an adjustment to the shelf location, Republic Lockers with recessed handles meet the operation and reach needs of the user. 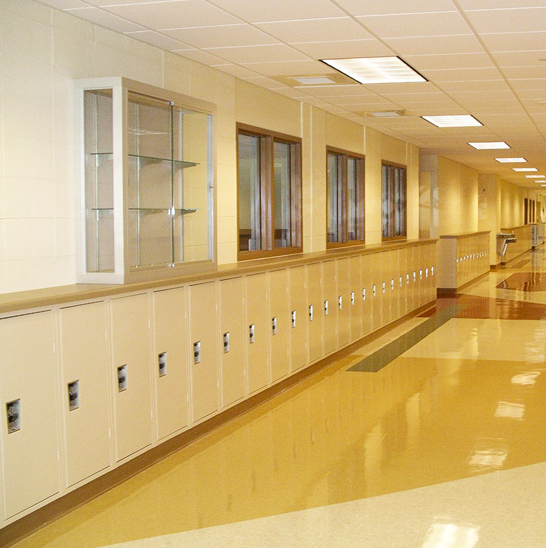 Lockers should be placed in an area to allow full door swing and wheelchair turning ability. ADA Compliant Locks are available. In addition, Republic offers ADA Compliant Benches. Ski Lockers are appropriately designed as tall, narrow units. This configuration creates the ideal locker for seasonal rentals at resorts and in ski area hotels and condominiums. The basic locker is 84″ high but with an optional sloping top, can hold skis up to 225 cm. in length. Hooks for hanging poles are provided as standard. Optional equipment includes slide stops to prevent skis from sliding out of open lockers, half-depth shelves for hats, gloves or goggles, and a stainless steel bottom. Configured for golf clubs and other sports equipment, Golf Lockers and Sports lockers are great as country club lockers and as sports lockers. The sports locker includes shelves, a partition, hooks and a coat rod as standard features. The lockers can be upgraded with accessories to include a locking compartment, golf ball tray, towel holder, comb and brush tray and mirror. These kids lockers bring the colorful, durable traits of Republic lockers to young children’s environments. These open storage units are made from 16- and 18-gauge steel to stand up to several generations of active kids. Ideal for daycare centers, pre-primary classrooms and elementary schools, our lockers for kids come in 25+ colors and several configurations featuring shelves, divided compartments and hooks for coats or book bags. Components are designed with rounded corners and smooth edges with safety in mind. Units 12″, 15″ and 18″ wide by 15″ deep and 48″ high are available in riveted or welded construction. 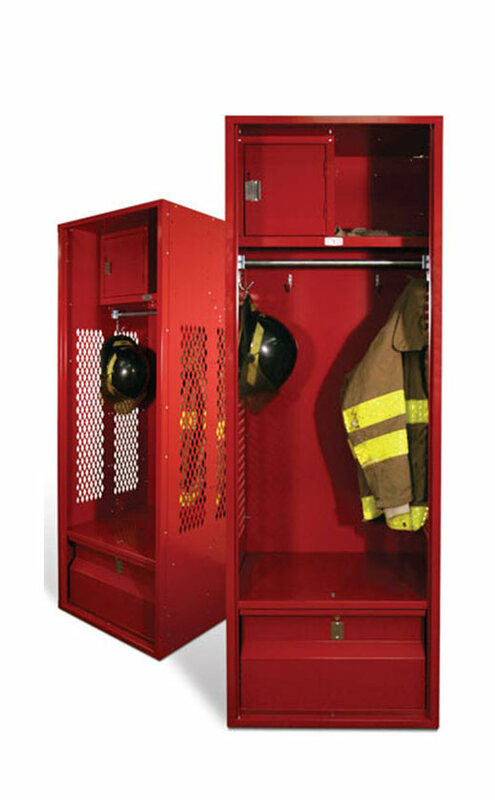 Cubby locker body parts are supplied in the same color as the frame at no extra charge. All components are manufactured from cold rolled steel. Available in galvannealed steel as an option. Finished, painted appearance of galvannealed steel may vary from non-galvannealed steel. Available in welded construction as an option. Ski Lockers are appropriately designed as tall, narrow units. This configuration creates the ideal locker for seasonal rentals at resorts and in ski area hotels and condominiums. 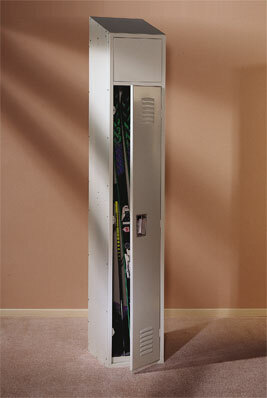 The basic locker is 84″ high but with an optional sloping top, can hold skis up to 225 cm. in length. Hooks for hanging poles are provided as standard. Optional equipment includes slide stops to prevent skis from sliding out of open lockers, half-depth shelves for hats, gloves or goggles, and a stainless steel bottom. Configured for golf clubs and other sports equipment, Golf Lockers and Sports lockers are great as country club lockers and as sports lockers. The sports locker includes shelves, a partition, hooks and a coat rod as standard features. The lockers can be upgraded with accessories to include a locking compartment, golf ball tray, towel holder, comb and brush tray and mirror.